This article was first published on analyze stuff. It has been contributed to Anything but R-bitrary as the second article in its introductory series. Today, we celebrate the would-be 85th birthday of Martin Luther King, Jr., a man remembered for pioneering the civil rights movement through his courage, moral leadership, and oratory prowess. This post focuses on his most famous speech, I Have a Dream [YouTube | text] given on the steps of the Lincoln Memorial to over 250,000 supporters of the March on Washington. While many have analyzed the cultural impact of the speech, few have approached it from a natural language processing perspective. I use R’s text analysis packages and other tools to reveal some of the trends in sentiment, flow (syllables, words, and sentences), and ultimately popularity (Google search volume) manifested in the rhetorical masterpiece. Word clouds are somewhat controversial among data scientists: some see them as overused and cliche, while others find them a useful exploratory tool, particularly for connecting with a less analytical audience. I consider them a fun and useful starting point, so I started off by throwing the speech’s text into Wordle. R also has a wordcloud package, though it’s hard to beat Wordle on looks. The qdap package provides functions for text analysis, which I use to split sentences, count syllables and words, and estimate sentiment and readability. I also use the data.table package to organize the sentence-level data structure. qdap’s sentiment analysis is based on a sentence-level formula classifying each word as either positive, negative, neutral, negator or amplifier, per Hu & Liu’s sentiment lexicon. The function also provides a word count. A scatterplot hints that polarity increases throughout the speech; that is, the sentiment gets more positive. Cleaning up the plot and adding a LOESS smoother clarifies this trend, particularly the peak at the end. Through the variation, the trendline reveals two troughs (calls to action, if you will) along with the increasing positivity. Readability tests are typically based on syllables, words, and sentences in order to approximate the grade level required to comprehend a text. qdap offers several of the most popular formulas, of which I chose the Automated Readability Index. By graphing similarly to the above polarity chart, I show readability to be mostly constant throughout the speech, though it varies within each section. This makes sense, as one generally avoids too many simple or complex sentences in a row. Google search results can serve as a useful indicator of public opinion, if you know what to look for. Last week I had the pleasure of meeting Seth Stephens-Davidowitz, a fellow analyst at Google who has used search data to research several topics, such as quantifying the effect of racism on the 2008 presidential election (Obama did worse in states with higher racist query volume). 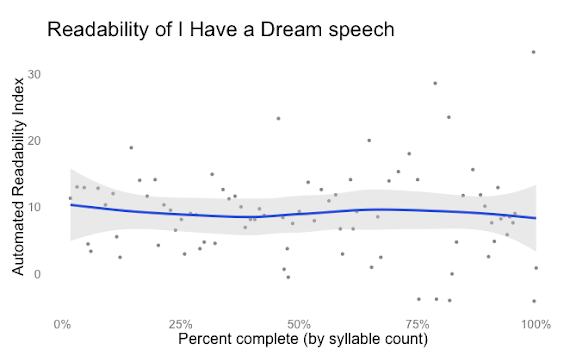 There’s a lot of room for exploring historically difficult topics with this data, so I thought I’d use it to identify the most memorable pieces of I Have a Dream. Fortunately, I was able to build off of a function from theBioBucket’s blog post to count Google hits for a query. From there I needed to pass each sentence to the function, stripped of punctuation and grouped in brackets, and with “mlk” added to ensure it related to the speech. 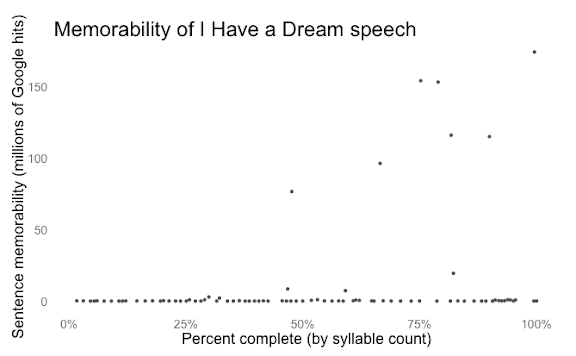 A quick plot reveals that there’s a huge difference between the most-quoted sentences and the rest of the speech, particularly the top seven (though really six as one is a duplicate). Do these top sentences align with your expectations? "And if America is to be a great nation this must become true." Plotting Google hits on a log scale reduces skew and allows us to work on a ratio scale. With several metrics for each sentence, along with the natural outcome variable of log(Google hits), I ran a linear regression to determine what makes a sentence memorable. I pruned the regressor list using the stepAIC backward selection technique, which minimizes the Akaike Information Criterion and leads to a more parsimonious model. Finally, based on preliminary model results, I added polynomials of readability and excluded word count, syllable count, and syllables per word (readability is largely based on these factors). stepAIC returns the optimal model, which can be summarized like any lm object. pct.complete.100        0.013366   0.006848   1.952  0.05449 . Four significant regressors explained 56% of the variance (R2=0.5564): a third degree polynomial of readability, along with pct.complete.100 (where the sentence was in the speech); polarity was not significant. 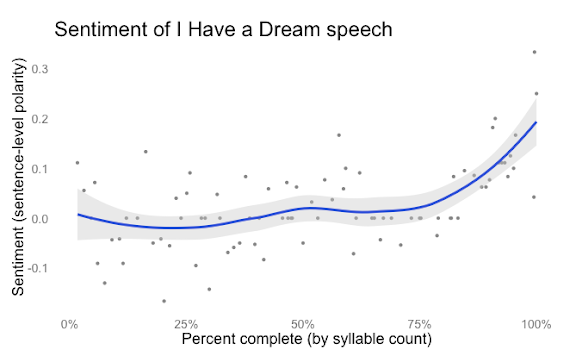 This result can be interpreted as the following: a 1% increase in the location of a sentence in the speech was associated with a 1.3% increase in search hits. Interpreting the effect of readability is not as straightforward, since I included polynomials. Rather than compute an average effect, I graphed predicted Google hits for values of readability’s observed range, holding pct.complete.100 at its mean. This cubic relationship indicates that predicted memorability falls considerably until about grade level 10, at which point it levels off (very few passages have readability exceeding 25). The speech starts and (especially) ends on a positive note, with a positive middle section filled with two troughs to vary the tone. While readability/complexity varies considerably within each small section, the overall level is fairly consistent throughout the speech. 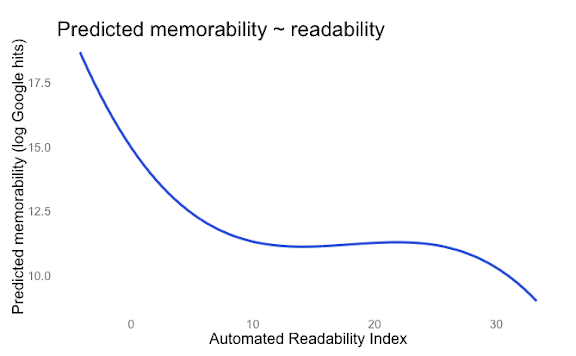 Readability and placement were the strongest drivers of memorability (as quantified by Google hits): sentences below grade level 10 were more memorable, as were those occurring later in the speech. To a degree, these were intuitive findings–the ebb and flow of intensity and sentiment is a powerful rhetorical device. While we may never be able to fully deconstruct the meaning of this speech, techniques explored here can provide brief insight into the genius of MLK and the power of his message. Thanks for reading, and enjoy your MLK day! Special thanks to Ben Ogorek for guidance on some of the statistics here, and for a thorough review. Special thanks to Mindy Greenberg for reviewing and always pushing my boundaries of conciseness and clarity. 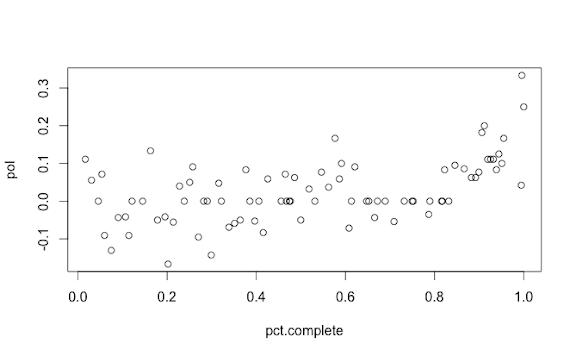 Thanks to Josh Kraut for offering a ggplot2 lesson at work, inspiring me to use it here. To leave a comment for the author, please follow the link and comment on their blog: Anything but R-bitrary.